Chess Insider is here! 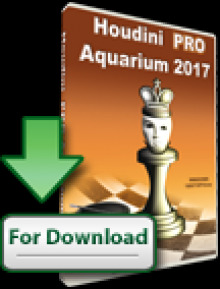 For the first time ever the chess fans can enjoy a daily multi-format chess periodical. Chess Insider is an initiative by a group of Grandmasters, aiming to bring detailed daily analysis and insights on the most important games. The month of March will have a total of 20 issues in pdf and pgn. 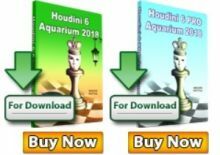 Issues 1-5 will be dedicated to the European Individual Chess Championship, while issues 6-20 will cover the Candidates Tournament 2014. 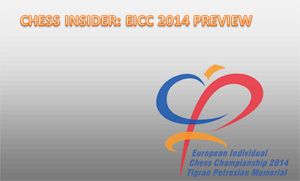 At least 12 games from the EICC 2014 and all 56 games from the Candidates will be commented on “Chess Insider March”. Adding to that the preview games and the possible tiebreaks, a total of 70+ commented games will be published in the month of March! Before the start of both events, there will be two issues covering previous examples of great games from those events, as well as predictions for the current World Championship cycle from a GM point of view. 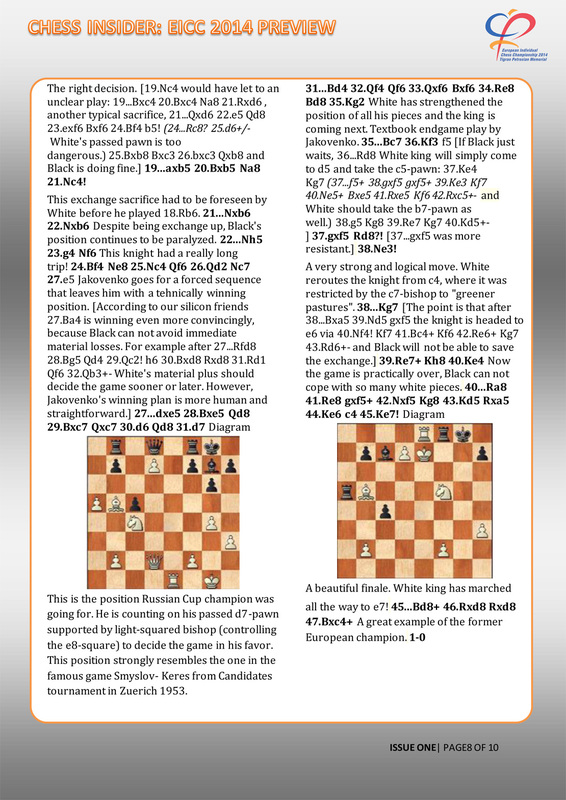 The final issue will bring you also Grandmaster analysis of Magnus Carlsen vs the Candidate winner, gearing up for the WCC 2014. All games commentary will be with a top-bottom design, bringing you a better understanding of the action, while acting as chess lectures. This way you can not only enjoy the games, but raise your game with the best practical examples on a daily basis. Two Grandmasters trainers – Kuljasevic and Arnaudov, together with WGM Videnova will be compiling the “Chess Insider” for you. However, multiple GMs of the 2600+ range will join every issue for games commentary, bringing you different styles and view points of the key moments. “Chess Insider” will be published in pdf and pgn. You can also request your copies in plain text or Word format, and at a later stage all copies will be available as flipbook. 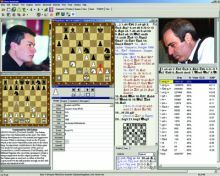 The “Chess Insider” aims to be more than a bulletin, more than a newsletter. It is a tool to learn from and enjoy the games from large championships, giving you the GM perspective, the previews, the historical view, the stats, and all the fun in one place. Chess Insider March Issue 1 is already out and is a preview dedicated to the EICC. The 10 pages contain detailed commentary of some of the best games ever played in EICC. Here is an example page (page 8 of 10) from the issue. Click on the image for full size.